Our Rippled Glass comes in a variety of colors, allowing you to bring your personal style to a classic look. This pattern has been used on bathroom windows for years, providing total privacy while allowing 75% of light through. A classic style in modern colors will help you bring a fresh look to any space. If you have any questions about this product by Window Film and More, contact us by completing and submitting the form below. If you are looking for a specif part number, please include it with your message. 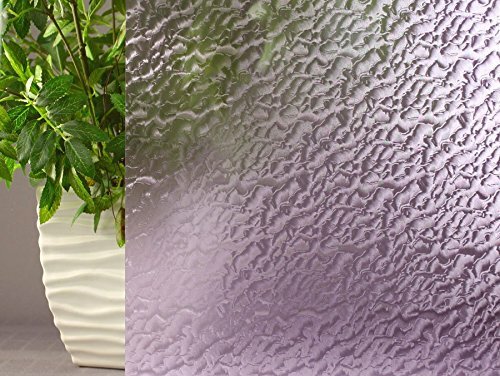 ARTSCAPE Etched Leaf Sidelight Window Film 12" x 83"
RABBITGOO Window Film Privacy Window Films Decorative Glass Window Cling Window Sticker Sun Blocking for Privacy Home Rental Apartment Living Room Bedroom Kitchen Office Meeting Room 35.4" x 78.7"
Artscape Savannah Window Film 24" x 36"